Cool Careers: What's it like to be a U.S. immigration lawyer? 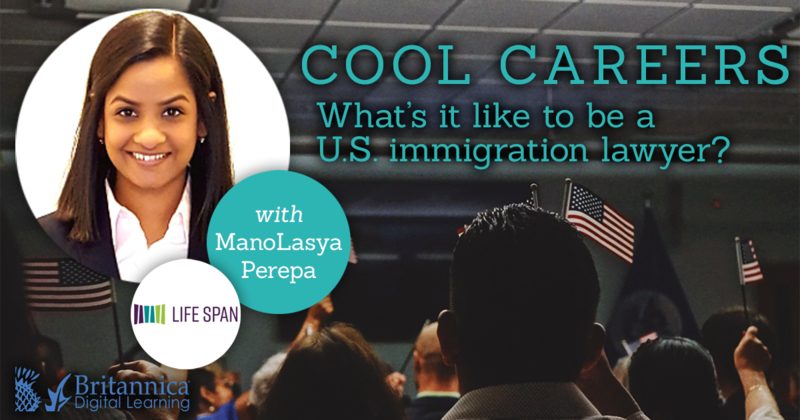 Cool Careers: What's it like to be a U.S. immigration lawyer? Cool Careers: What’s it like to be a U.S. immigration lawyer? What does an immigration attorney do and how do you become one? This March, meet ManoLasya Perepa, an immigration attorney at Life Span, a non profit organization that serves survivors of domestic violence and sexual assault. I help survivors gain legal immigration status so that they may leave their abusers in order to work, live, and prosper in the United States. I received my Juris Doctor from The John Marshall Law School in 2017. During my law school career, I was an intern at The Department of Homeland Security’s Immigration and Customs Enforcement, the National Immigrant Justice Center, and The John Marshall Law School Fair Housing Clinic. I graduated with my bachelor’s degree in Global Studies and Spanish from the University of Illinois at Urbana-Champaign in 2014. During my time in undergrad, I took courses in international security, Latin American culture, women’s rights, and democratic institutions. I had internships at the Department of Defense and the Arms Control, Domestic & International Securities program at UIUC. I also studied abroad and traveled in Ecuador. Outside of work, my hobbies include baking, re-reading the Harry Potter series for the hundred millionth time, and dancing. I have been practicing Kuchipudi, which is a dance form originating from South India, for the past 18 years. Founded in 1978, Life Span provides comprehensive services for women and children, enabling them to live without violence, build upon their strengths and become self-sufficient. • Cool Careers: What’s it like to be an aquarium scuba diver?